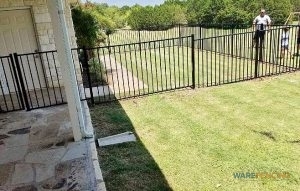 Do you need a dependable fence company in Colleyville, TX? The professional crew at Ware Fencing can help you with fence repair, as well as fence installation or replacement. When you are intending to increase the value as well as the curb appeal of your home, these services can help you get there. We are fencing professionals, and regardless of what your goal is with your fencing, we can help you achieve it. 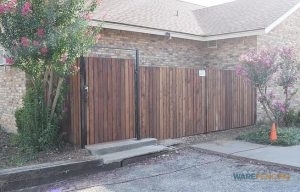 To discover more about your fence choices, give us a call at 817-948-4503 today! We have been servicing houses and businesses in this community for years, and we are the local fence company Colleyville can trust. Unlike other fencing companies, our team is trained in many kinds of fences, such as farm or ranch fences. You can choose from any of our residential fencing options, including bamboo, wrought iron, chain link, and more! If you’re searching for privacy, we recommend cedar, but if you are looking for something affordable that won’t block your view, aluminum is a fantastic choice as well. As far as security is concerned, you can count on us for wrought iron fencing, or even specialty security fences. If you don’t find what you’re looking for here, you can even rely on our team for specialized custom fence designs. Chain Link Fences A chain link fence can be used as a permanent installation, or a temporary set up. We work diligently to be the fence company in Colleyville, TX that our community can rely on. We only use top quality materials, and customer satisfaction is our #1 objective. Each client we work for gets a full assessment, and we work diligently to build fencing to your exact specifications. Call the crew at 817-948-4503 today to talk to one of our professionals, and schedule your appointment. If you need a fence company that will not disappoint, we are the experts for the project.